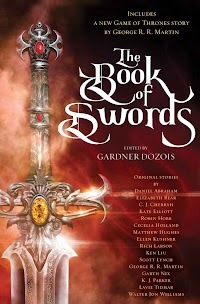 "The Book of Swords," edited by Gardner Dozois, published on October 10, 2017 by Bantam Books. The Book of Swords contains 16 stories, of which we recommend 6 (average would be 3) and recommend against 1 (average would be 3), which is outstanding. 7 are thieves, assassins, or other "sneaky types"
Even though the protagonists tend not to be magicians, their companions and opponents use magic freely, and the various thieves and assassins avail themselves of swords (or at least knives) so the stories are a pretty good fit to the concept of a "pure" Swords-and-Sorcery anthology. Even the three-star stories are fun reads, for the most part. They simply lack the plot sophistication and/or character development of the recommended ones. This is an awfully good anthology, and we recommend it highly. In The Smoke of Gold Is Glory, by Scott Lynch, an old man tells about the greatest adventure of his youth, when he and three companions invaded the fortress of the last and greatest of dragons, who guarded the greatest treasure in the world and challenged anyone to try to take it. The Hidden Girl, by Ken Liu, tells how a young girl raised as an assassin performed her very first mission and what she learned about herself and the world. The Sword of Destiny, by Matthew Hughes, relates how Baldemar the thief failed to steal the Sword of Destiny and how that led to one damn thing after another for him and for everyone unfortunate enough to be involved. The Mocking Tower, by Daniel Abraham, recounts a quest to take a sword from the magical, ever-changing Mocking Tower--a sword reputed to hold the soul of the last emperor, and which might allow a claimant to finally take the contested throne. Hrunting, by C. J. Cherryh, picks up the Beowulf story two generations later when a young man returns the the lair of the monsters to try to recover a legendary sword that had belonged to his grandfather, and which might restore honor to his household. In The Colgrid Conundrum, by Rich Larson, we visit the smoggy, industrial city of Colgrid in the company of two gentleman thieves who need a skilled locksmith to open a box they've stolen from another city. But the locksmith requires a service, not a fee, and this tangles them deep in the affairs of the city. I liked the anthology quite a bit as well, though it's interesting that the only story in my very top list that is in yours as well is "The Mocking Tower". The others in my top four were the Elliott, Williams and Tidhar stories, with the Larson and Lynch in another list of namechecks. I guess that's a sign of a pretty darn strong book! Two of those (Williams and Tidhar) were stories I seriously considered for four stars, owing to their very strong worldbuilding. But the first feels like a novel excerpt with no real ending, while the second had a protagonist who came across to me as weak. For that matter, that's my complaint about the Elliot story as well. It reads like an excerpt from a very interesting novel, and it was fine as a novella--just not outstanding. Yeah, it's a very strong book. Depending on what you value (e.g. plot, setting, characters), there's an argument in favor of almost every story. The Williams of course is, if not a novel excerpt, a sort of introduction to his new novel. I liked it enough to buy his novel, "Quillifer," so I guess it's ironic that I didn't recommend the short story. That's because I liked the character and the setting, but I felt the plot was unsatisfying, and, for me, plot is king when it comes to ratings.